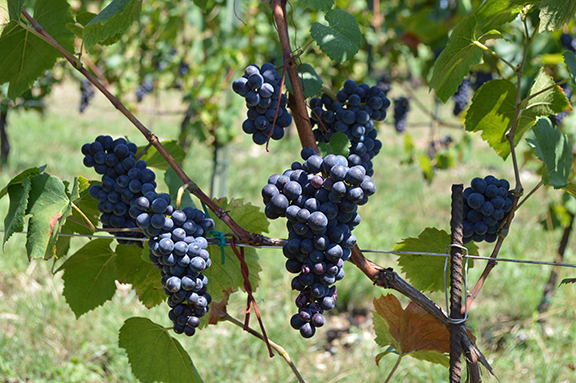 Above: Organically farmed Pinot Noir grapes were still on the vine when I visited Franciacorta week before last. In part because I was traveling there with a wine writer who devotes her attention primarily to chemical free viticulture, the focus of my recent week in Franciacorta was on organically farmed vines. The fact that there is a lot of organically farmed Franciacorta was no news to me. But I was blown away by new data published by the consortium: Today, roughly 50 percent of Franciacorta is farmed organically. That number jumped from approximately 30 percent last year to 50 percent this year because one of the appellation’s biggest growers has now begun conversion to an organic farming regimen. This doesn’t mean that 50 percent of Franciacorta is organic certified. It will take some years before such a large swath of the appellation can be officially recognized as organically farmed. But it does mean that a near majority of growers have abandoned chemically based farming altogether.